I love enchiladas. When I was a kid, I never understood why Nana said they were so much work- at my house, my mom would crack a can of enchilada sauce, roll cheese in a tortilla, and pop ’em in the oven. Presto! 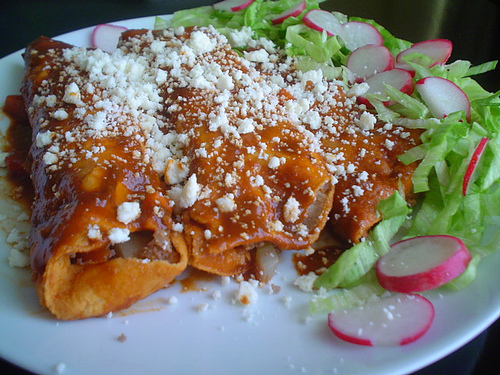 American enchiladas. And even those were good. But then I learned how to really make them… and my culinary world changed. I also understood why Nana said they were a lot work. When I’m feeling really ambitious, I even made masa and press my own tortillas, but you don’t have to. Good quality tortillas are available at any latin grocery, and you should totally get them there. Fresher, better all around. With the help of a crock pot, this recipe is easy, and the ingredients are found in most kitchens. (Seriously though, I can’t encourage you enough to head to the international or latin market near you.) Remember, improvisation is part of the adventure of cooking, and cooking is awesome. Regular enchilada sauce is made by roasting and softening dried chilies in oil, simmering them in broth and spices, and pureeing them in the blender. I can give you the recipe for that another day. This sauce uses chili powder and tomatoes, but despite the shortcut, the beef creates an unctuous texture and outstanding depth of flavor. Heat oil in a heavy skillet and pat beef chunks dry. You want to form a good brown crust on them, and if they’re wet, they’ll steam. Brown all chunks and season with salt and pepper. Brown over medium-high heat, turning only as needed, until caramelized and dark brown on most sides. Transfer to crock pot standing by. There are a lot of good browned bits on the bottom of your frying pan. Deglaze the pan by adding the 2 ounces of wine to the pan and using a spatula to get all the goodness up- transfer to crock pot. If you prefer not using wine, use chicken broth or water. It won’t taste as deep, but it will still work. To the crock pot, add the minced onion, spices, garlic and tomato puree. Stir to combine and cook on low for 3-5 hours, or until the meat is falling apart. I start mine in the morning and let it go all day. Saute remaning minced onion until soft, mix in a bowl with the other half of the beef and the 2 cups of grated cheese. Any shredding cheese you like is fine- colby, a mix of cheddar and jack, or Mexican cheese. Cover with foil and bake at 375 for 20-25 minutes until the cheese is bubbly and hot. Just to clarify: half the meat goes inside the enchilada, the other half goes on the outside. Correct? Yes. Half gets shredded and mixed with the cheese, half gets shredded/minced and put back in the sauce. Sorry if that wasn’t clear. Can I come over for dinner? !